Had a great time! I was doing this tour by myself but made friends as soon as I got on the bus, our guide could also speak English and was really great (Ken)! Really good experience and would recommend, just make sure to take snacks! Very fun tour with certificate and onsen included, which means you don't leave this tour empty-handed, even if you don't buy anything . Furthermore, you bring with you a lot of memories ! What an amazing experience! This is very much aimed at Japanese people with little to no English spoken by the tour guides/event itself BUT not to be missed if you have the opportunity. I have never seen anything like this amazing display of fireworks anywhere in the world and we felt very privileged to be a part of the festivities. Everyone was so welcoming, helpful and inclusive even though the language barrier was more prominent then any other time during our trip. We did ended up doing our own research on the history of the festival and even translated a website with the event run down. It was so easy to get swept away in the story telling, music and of course amazing fireworks! 100% would go again! Easily the highlight of our Japan experience. We had a biggish group of about 20 ranging from all ages from all around the globe. Most of us picked up our hiking equipment with the tour group. Everything was super easy and I highly recommend hiring equipment unless you are planning on more hiking throughout Japan. Lots of different sizes, everything worn but clean and in very good condition and they make you try it all on before you leave to make sure you have the right sizes. Our guide, Ken was amazing, limited English but very keen to speak to everyone and made sure we were all very well looked after. Super patient and catered for both the strongest and the weakest in the group. All the huts are well looked after and well stocked for everything you might need but I do recommend bringing your own food/water/sports drinks. Bring lots of small change for using the toilets or getting your climbing stick stamped as well. The hut we stayed in was comfortable and warm with a hearty dinner. The hike up is tough (for beginners like us) and it was VERY hot and sweaty work (we climbed up at the beginning of August) but so well worth it to see the sunset at the very peak of Fuji the next morning. It did feel a bit rushed getting to the top, climbing around the crater and then all of a sudden we were instructed to start the climb down. We would have liked a bit more time to soak up the experience but we didn't want the group to leave us behind. The onsen at the end of the trip would have been a lovely experience but both my husband and I have tattoos and we were not allowed to go into the baths. This was super disappointing and a pain having to wait for everyone. Had I have known beforehand I would have organised another way back to Tokyo but you live and learn. I can't recommend this experience enough. 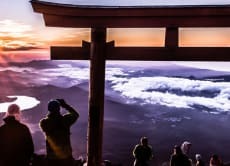 Even if you are an experienced hiker, the organisation around transfers, equipment hire, hut stay and onsen is more then enough reason to book this trip. It’s a remarkable hike that everyone has to stay together during the hiking and the tour guide speaks almost perfect English. The pace is slow and steady ( excellent) and the guide make sure all of us is safe and sound. I wouldn’t make it to the top and return if it’s not because of the guide. Japanese gives full responsible in whichever professions they are working. The downside of the trip -We don’t have long rest or chilling time because we are running on schedule - catching the dinner, catching the sunrise, catching the return bus. Only 5-10 mins break and a total of 5 breaks. The overnight hut was small, narrow bed as such you touch each other shoulder but it’s just for 4 hours nap. Drinks are super expensive (500jpy) but we will pay to prevent dehydration anyway.